Marshfield Police Department. Used with permission. A bear was spotted earlier this week on the west side of Marshfield. 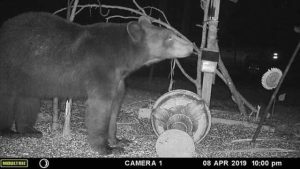 In photos taken Monday night and Tuesday by a trail camera, the bear was found checking out a resident’s yard near the university. Marshfield Police Department released the photos with a friendly reminder for residents to put out garbage in the morning instead of overnight and to keep bird feeders out of reach. They noted that bears typically avoid interacting with humans. For tips on dealing with wild animals this spring, follow this link.